In spring, a young spinner's fancy lightly turns to thoughts of sheep-and-wool shows. At least, this not-so-very-young spinner's does. Not that it doesn't at other times! But let me out of the gate in April or May, after a long indoor winter with limited lanolin, and you can be sure I'll be making a beeline for the nearest fleece barn. Huffing the wool fumes. Fondling the staples. Luxuriating in the grease. Making bedroom eyes at the crimp. Fleeces are like potato chips - I don't see how anybody can choose just one. I adore colored fleeces, especially in broad ranges of grey; on the other hand I'm more attracted to shiny white ones than is strictly rational, considering that I don't do much in the way of dyeing. I love the lustre and curl of longwools, but I am not immune to the beauty and delicacy of a good finewool, I'm easily seduced by the oddities of the primitives, and you can't beat a downs breed for spring and durability. And sometimes the most exciting find of all is that quirky once-in-a-lifetime mix, the mystery mutt fleece, the genetic melting pot. I don't need a specific goal; the fleece itself is desirable and satisfying in a way that has nothing to do with its potential uses. I fall hard for the shiny, the soft, the curly, the bold, the pristine, the rakish, the intriguing multi-personality cross. I have a terrible tendency to want them all... just because. Fleeces are an investment in happiness. Besides, just think of all that flame-retardant insulation. Still, even I have to admit - there's more to this fleece game than the thrill of acquisition and the smugness/snugness of possession. Sooner or later some of that inchoate fleece lust is apt to take concrete form. And when it does... whoo baby. Watch your back, Sum-of-the-Parts... the Whole is gonna wipe the floor with you. Going from sheep to sweater is all about process. No, wait -- it's all about product. No, wait -- actually, it's both, and that's the glory of it. There's deep pleasure in every stage of the doing of it, and then at the end you get to wrap yourself not just in wool but in achievement and memory. It almost doesn't matter how you come at it. See fleece , picture sweater. Good. Plan sweater, seek specific fleece. Also good. Have fleece , suddenly realize it could become sweater. Also fine. Disclaimer: What follows is personal and perhaps just a touch subversive. If you want to know how to do this right, there's already plenty of good literature on the subject. What you're reading here... is something else. I can't say any of it is actually wrong, though. Think of it as a manifesto for the other half, for those of us who tend to get into hot water with yes-buts and what-ifs. Think of it as more than one way to skin a cat. If nothing else, think of it as the approach that worked for me when I spun the yarn for Darrowby... worked so well that Iâ€™ve stayed with it ever since. What Do You Want from a Fleece? There is a lot of conventional wisdom out there about choosing a fleece, just as there is about spinning for a sweater. Conventional wisdom is all very well; it is conventional because it is wise, and it is often wise to be conventional. But there is also something to be said for questioning the conventional wisdom; for asking oneself, "yes, yes, but does that apply to me, right here and right now?" I invariably answer that question with Rule Number One: In the immortal words of Maggie Casey, "It Depends." Inconsistent staple length: The best of the wool was 5" long or better, but there were parts as short as 2"
So why buy a fleece like that at all? Romantic answer: Because it sang to me. Practical answer: Because the good parts of it were very good indeed; because I knew there was enough good wool to make exactly the sweater I wanted; and because the price tag reflected the defects. The color and crimp were wonderful, the locks sound. The way I see it, at $4/pound I was paying $20 for a sweater and getting the pleasures of the process for free. That's all a question of how much you enjoy the process, of course. Myself, I rather like getting a little down and dirty with a fleece; I don't get my kicks from handling the really serious filth, but I certainly don't mind doing lock triage, or dealing with a little caked mud or a lot of VM. I like a challenge. As long as the wool itself is healthy, chances are I can get what I want out of it. Moral of that story: Buy the fleece you want, and know why you're buying it; if it's a gamble, be realistic about the risks. Life is too short to spin really bad fleece, but life is also too short not to take a chance now and then. How Big a Fleece Should You Buy? There is a spinners' joke to the effect that when the question is "How much fiber do I need?" the answer is always "Four pounds!" In the case of Darrowb,y this was more or less true. (Oddly, it remains very nearly true at all sizes, if only because for the larger sizes you may want to spin a somewhat lighter yarn to keep the weight of the finished garment within a reasonable range.) 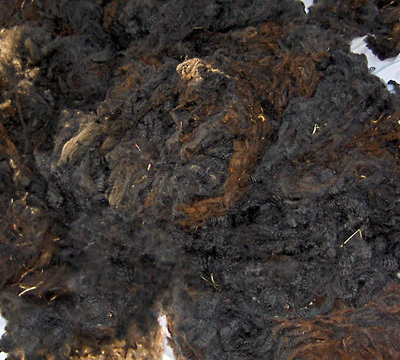 Like so many thing,s this is a judgment call: the condition and the quality of the fleece are important considerations, and the more finicky you are about prep, the more of that fleece is going to end up on the mulch pile. As a general rule, assume that on average about 30% of any fleece will be waste of one kind or another. A very clean fleece with little grease will produce more bang for your wool buck than a dirtier one, and less likelihood of processing waste means less fleece needed. A beautifully clean finewool -- a coated Cormo or Merino, for example -- may have very little in the way of dirt, but when you scour it, a surprising percentage of its weight will melt away with the lanolin. In any case, this is one area where I prefer to err on the side of caution. It's not as if the extra wool is likely to go to waste (matching hats, scarves, and mittens, anyone?). And on the other hand, if you don't have enough of that once-in-a-lifetime fleece to finish a particular project, heartbreak can ensue. Overall, I almost always think More Is Better. Using Darrowby as an example again - the sweater itself, worked up in Medium size, weighs just over two pounds. 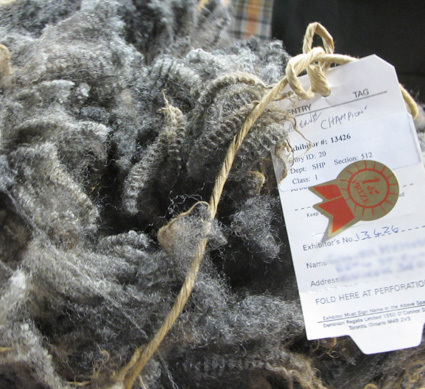 The original fleece weighed five pounds. Nearly two of those pounds became processing waste; the remaining pound or so made a nice heavy insulating hood/scarf thing, plus a handsome contribution to the Handspun Stash. So do you need five pounds of fleece to make a two-pound sweater? Probably not, as a rule. Would I be comfortable cutting it closer than that? All I can say is... why ask for trouble? The conventional wisdom says that for consistency in a project like this you should prepare all the fiber at once, then spin it all at once, then ply it all at once, then begin to knit. (All this after copious sampling, of course.) And far be it from me to contradict the conventional wisdom. I can tell you, though, that if you are really obsessively driven, the path of conventional wisdom is not necessarily the only way to go. I can't deny that it's a good way; a wise way; a prudent way. But for those of us with attention-span issues it can also be a mind-numbing way, a way that madness lies. You've heard it a hundred times; you may have said it yourself: A big spinning project can seem to take forever, and that's not even counting the plying, which takes several lifetimes at least. I put it to you that for some of us, at any rate, the chances of our actually finishing a big project improve exponentially if we get to mix it up a bit, inject a little variety, by working in stages. That's what I did with Darrowby, and have done with several projects since; for me at any rate it seems to be the way to go. After the fleece was scoured, after I'd done some sampling, I prepped enough fiber to spin two 200-yard skeins of my chosen yarn, then used some of that for extensive swatching and experimentation. Once I had a clear idea of what I was going to do, I frogged the lot. Now, this is the point where a grown-up would have stopped to prep, spin, and ply another eight to ten skeins, right? Not me. I was too fired-up. I rewound the yarn, cast on, and started knitting in earnest, continuing feverishly until -- predictably -- I came to the end of the second skein. Frustration! Wailing! Gnashing of teeth, rending of garments! Then I calmed down, had a good laugh at my own expense, and broke out the flicker and drum carder. After that the project took on a daily rhythm. 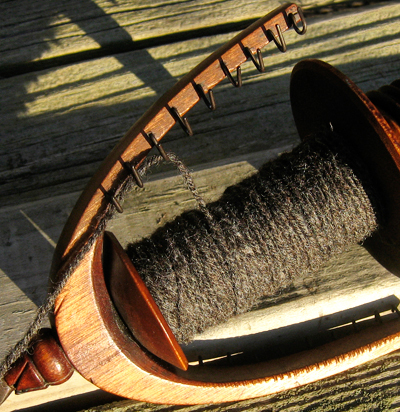 I would produce a 200-yard skein of 4-ply in an evening - weigh fiber for blending, then flick, card, spin, ply -- then wash and hang to set the twist overnight. 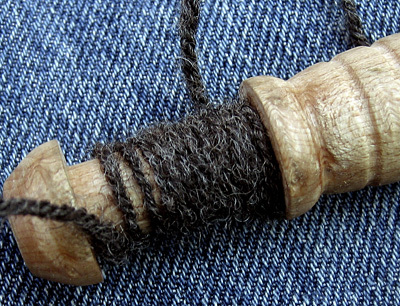 The next day I would knit until I ran out of yarn, and then I'd start the whole cycle again. 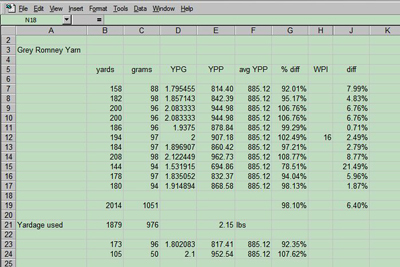 I logged yarn details (yardage, grist, twist) in a spreadsheet, and I found that from one day to the next I was getting remarkably consistent results. Also that cycling in this way through prep-spin-knit prevented any one part of the process from driving me too far up the wall of sameness. Granted, the one-day cycle is a little extreme. But even if you don't have the time or the obsession for that particular degree of momentum, it's still a valid exercise if you stretch it out over a couple of days... a few days... a week. It's still a valid exercise if you do a bigger chunk at a time - spin several hundred yards before shifting gears into knitting, or do all the prep at once before you start the spinning. There's no hard and fast rule; experiment and find the rhythm that works for you. What I like about cycling through the stages is not only that it staves off boredom and choredom, but that it keeps me in touch with all parts of the process at once. As I prep and spin each skein I actually know which part of the sweater it's going to be; I find that oddly satisfying. And there's no such thing as getting into a rut. Knitting up each skein as it's spun forces me to take a break from the spinning; spinning each skein as I need it forces me to take a break from the knitting; I come back to each part of the process refreshed, indeed champing at the bit. Consistency? I actually find that if anything my spinning is more consistent when I work this way. Even though I'm not doing all the spinning at once, there's still a rhythm to it, a routine. Typically in this cycle I find myself always spinning around the same time of day; habit and muscle memory fall into a natural groove, and the yarn I want to make is instantly familiar to my hands. How Consistent Is Consistent Enough? Again I invoke Rule Number One: It Depends. With most of the yarn for Darrowby, I managed to stay within 10% of my target grist. 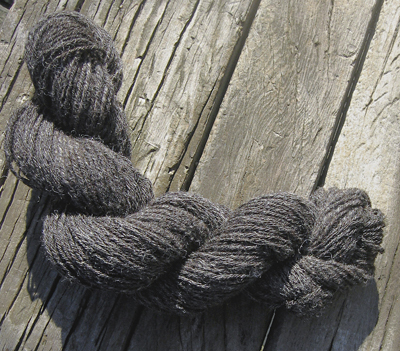 Tthe average was actually closer to 6%, with only one skein out of 11 really far off base. The other 10 were even enough to produce smooth respectable stockinette and crisp cables, which in my book makes them plenty consistent enough for a project of this kind. It isn't THAT big a difference. The knitting will hide it. A couple of inches later, I finally had to face facts. It was a huge difference; the knitting made it glaringly obvious; blocking would have made it still worse. Curses. Many unprintable remarks. And then the frogging. All was not lost, however, for that 11th skein. 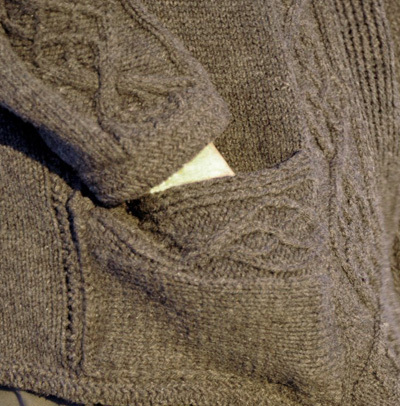 It is sometimes helpful to bear in mind that all parts of a sweater are not created equal; in Darrowby's case, there was no reason not to use the thinner yarn for the ribbed band/collar, where indeed it does not make much of a difference and the knitting does hide it. I could also have used it for pockets and hem facings; in a different style of sweater it would have been usable for cuffs, collar, and waistband. Sow's ear - silk purse; done deal. Ultimately, how you go at this is your call. There's nothing wrong with following all the rules, but there's nothing wrong with pushing the envelope either. Live a little. Sheer tactile satisfaction and bragging rights aside, the real point of the sheep-to-sweater exercise is simply this: To get exactly what you want, exactly the way you want it. It's just a question of determining what that is. I think of it on a sliding scale: At one end of the spectrum you raise and tend and shear the sheep yourself; at the other you buy your sweater from a high-end boutique, or pay a fortune to have it custom-made for you. Most of us fall somewhere between those extremes. If you consider fiber prep a chore, you probably haven't read this far anyway; that said, only you can determine how much of the process you actually want to undertake and how you want to undertake it. Measure the value of your time against the effort expended; measure the effort expended against the pleasure derived. On one side of the coin, I used to charge by the hour for fixing other people's computers. 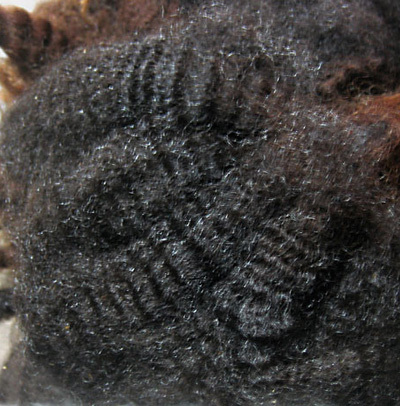 On its obverse, the hours I spend preparing fleece for spinning? I count those as entertainment. I wouldn't dream of paying someone else to have the fun of it for me; the labor we delight in physics pain. Having survived several overlapping careers in the performing arts, a stint as a computer consultant and another as a culinary historian, Lisa Grossman has returned to her early passion for textiles and been reborn as the Tsarina of Tsocks. 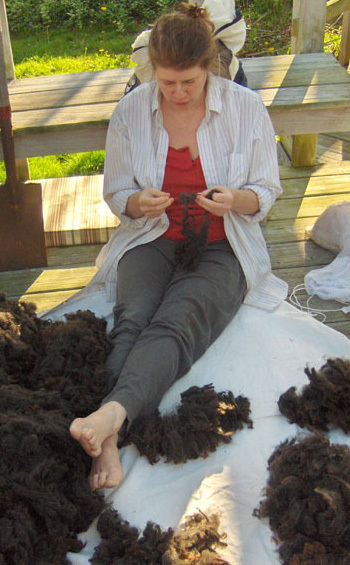 She brings all of the above - plus the kitchen sink and a huge pile of knitted leaves - to her crazy-making creations, which can be found here, as well as on the feet and needles of many notable knitting cognoscenti. Taught by her mother and inspired by the independence of Elizabeth Zimmermann, Lisa has been knitting for nearly half a century; she vaguely remembers following a pattern once, before striking out into her own road-less-traveled tbly. She teaches her "Art for your Feet" brand of inspired lunacy, most recently at Sock Summit 2011. 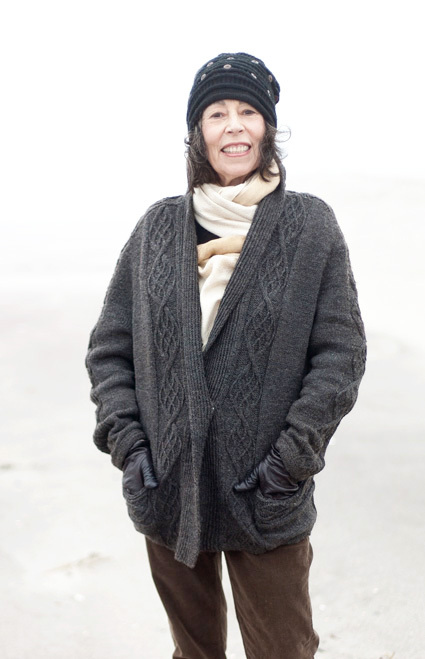 She is the surviving co-author of Lobscouse & Spotted Dog (which one critic called "the only cookbook that will ever find a place on my nightstand"), and has written for Tin House Literary Quarterly, Napoleon Journal, the New York Times, Spindlicity, and KnittySpin. Her door is always open in the Tsock Flock group on Ravelry.